On July 12, 1916, the Scotts Bluff County Commissioners applied for state aid for the construction of this multiple-span bridge over the North Platte River at Mitchell, as well as two other Platte River structures at Henry and Morrill. In October local citizens voted to approve a bond financing the county's share of building the North Platte bridges. The project was accepted for state funding, and on January 21, 1918, a contract for the Mitchell Bridge was let to the Omaha Structural Steel Works. The structure was erected as a series of twelve 50-foot concrete arches for a total cost of almost $60,000. The roadway was widened in 1939, and footings repaired in 1959, but the bridge is otherwise intact. Between the inception of the state aid bridge program in 1911 and the time it was phased out in 1936, the Nebraska State Engineer's office had designed and built 17 multiple-span concrete arch structures, most in the 1910s. All but five of these have since been demolished. 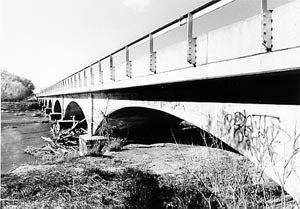 The Mitchell State Aid Bridge is thus significant as among the last of what was once a mainstay river bridge configuration in the state.